Figure 1: Consensus tree of Phyllodocida, based on analyses by Glasby (1993), Rouse and Fauchald (1997), and Pleijel and Dahlgren (1998). The name Phyllodocida was introduced by Dales (1962) for a group with very similar composition to the one represented in the tree above (except Myzostomida; see below). Phyllodocida, together with Amphinomida and Eunicida, makes up the major part of Aciculata, approximately corresponding to what in earlier literature was referred to as "errant polychaetes". The exact number of described species within Phyllodocida is difficult to assess, but we estimate that more than 3500 species names are treated as valid today. 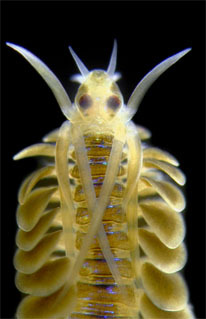 Most Phyllodocida are active animals that move over and in sediments, or live in cracks and crevices in hard surfaces. Only a few construct tubes and have more sessile life-styles. Many are brightly coloured, with beautiful pigmentation patterns. While most Phyllodocida live their adult lives on the bottom, a number of different groups spend their whole lives being pelagic (=holopelagic); these tend to be transparent. The majority of Phyllodocida are marine, although some occur in brackish waters and a few nereidids and nephtyids live in freshwater, and some nereidids occur in terrestrial habitats (e.g., Wesenberg-Lund, 1958). 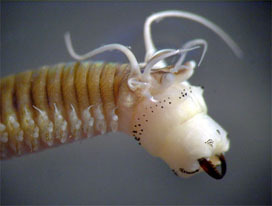 More familiar members of Phyllodocida include those that are common intertidally, including rag worms (Nereis and allies), which are commercially important as fish bait, various scale-worms, and the venomous blood-worms (Glycera). Adult sizes are highly variable, ranging from a few mm to over a meter in length. 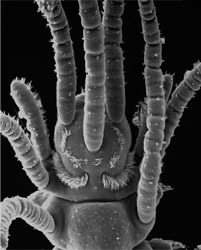 Suggested synapomorphies for Phyllodocida include ventrally positioned sensory palps, an axial eversible pharynx, presence of anterior enlarged cirri, compound chaetae with a single ligament, and metanephromixia (Glasby, 1993; Rouse and Fauchald, 1997). However, this list may appear much more impressive than it actually is, as most of these features are homoplastic (Fig. 3, for example, shows a nereidid compound chaeta with double ligaments), and virtually all require further study. Also, as discussed in the Annelida page, it has been suggested that Phyllodocida may be a basal paraphyletic grade of annelids, although this has generally not been supported by morphological data. Figure 3. Compound chaeta of a nereidid with double ligaments between blade and shaft. Copyright © 1997 Fredrik Pleijel. The prostomium of Phyllodocida generally has one or two pairs of eyes (although a number of blind members exists), a dorsal pair of antennae, a ventral pair of sensory palps, and a pair of nuchal organs situated at the posterior edge of the prostomium (Fig. 4). 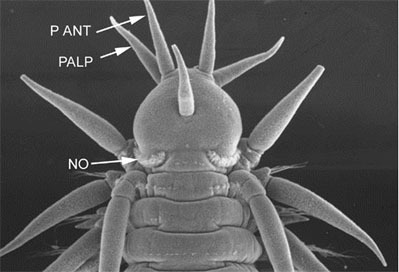 The palps and paired antennae may look similar, as in phyllodocids (Fig. 4) and glycerids (Fig. 9), or the palps may be larger and more elaborated, as in hesionids and nereidids (Fig. 5). Figure 4. A phyllodocid, Sige fusigera, Sweden, anterior end in dorsal view, arrows indicate palp, paired antenna (P ANT) and nuchal organ (NO) on the left side. Copyright © 1987 Fredrik Pleijel. Figure 5. A nereidid, Hediste diversicolor, Sweden, anterior end in ventral view. Arrows indicate paired antenna (PA), palpostyle (PS) and palpophore (PP), right side. Copyright © 2000 Fredrik Pleijel. The peristomium is a ring, but is often dorsally concealed by the prostomium and first segment. (Note, however, that there are uncertainties in some groups as to what actually constitutes the peristomium vs. the first segment, such as in nereidids.) 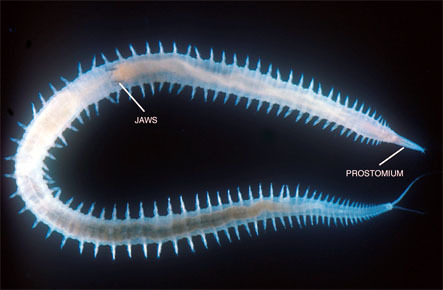 There is an axial muscular proboscis (eversible pharynx), that in many taxa is distally or internally equipped with one or several pairs of jaws (Fig. 6). Figure 6. 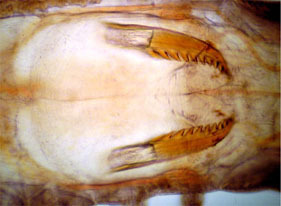 Everted proboscis of a nereidid, Neanthes vaalii, showing jaws. When retracted (right) the jaws of nereidids are held inside the body. Copyright © 2004 Greg Rouse. Segment 1 and, sometimes, several following segments tend to differ from "normal" segments in having enlarged dorsal and ventral cirri and reduced parapodial lobes and chaetae. Otherwise, most have many segments that are similar to each other, usually without abrupt changes of parapodia and chaetae, but gradually shifting in proportions along the body. Both uni- and biramous parapodia occur, and chaetae appear in a large variety of shapes, including simple and compound ones. Dorsal and ventral parapodial cirri are almost always present, and there is usually a single pair of pygidial cirri. Although most members would appear to have separate sexes, a number of hermaphrodites also exist. Some Phyllodocida, especially within nereidids and syllids, undergo drastic morphological changes in association with reproduction. When introduced by Dales (1962), the name Phyllodocida did not include Myzostomida. This latter group of symbionts on echinoderms, mainly crinoids, was referred to Phyllodocida by Rouse and Fauchald (1997), although this has recently been challenged by Eeckhaut et al. (2000), who based on molecular evidence suggested that they instead are more closely related to flatworms. The issue remains unresolved, but we here tentatively treat them as members of Phyllodocida. As noted in the Introduction, the features supporting Phyllodocida may be homoplastic, and there are two obvious problems "threatening" the monophyly of this group. 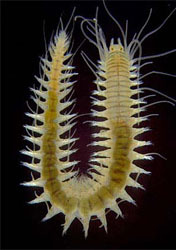 One is the suggestion that the root of the polychaete tree, or even the annelid tree, is situated within the Phyllodocida, an issue that is discussed in the Annelida Discussion of Phylogenetic Relationships. Another is the relationships to other taxa within Aciculata. 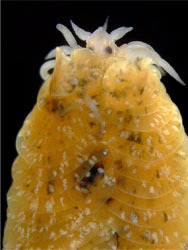 Both the two other major Aciculata clades, Eunicida and Amphinomida, are identified by a number of unique and unreversed features, and both of these clearly appear monophyletic. However, considering the weak support for the group, there are possibilities that Eunicida and/or Amphinomida have their sistergroup(s) within Phyllodocida. Identified and named major subgroups in the tree above (Fig. 1) include Aphroditiformia, Nereidiformia, and Glyceriformia. Of these, Aphroditiformia are united by the obvious feature presence of elytrae ("scales") on a number of alternating segments (Fig. 7). Figure 7. Unidentified polynoid scaleworm (Aphroditiformia) commensal on a crinoid. Note bright red elytrae. Copyright © 1998 Greg Rouse. The position of Pisionidae (Fig. 8), though, is more uncertain, and in the consensus tree above this is illustrated by their position in a basal polytomy. Rouse and Fauchald (1997) classified them together with Paralacydonia and Glyceriformia, whereas in Pleijel and Dahlgren (1998) they appeared as sister to the scale-worms (see Pleijel, 2001a for further references). The delineation of Nereidiformia is not straightforward. The composition here is in agreement with Glasby (1993), and with some but not all of the topologies obtained by the morphology-based analyses of Pleijel and Dahlgren (1998). In these two studies there is full consensus on the monophyly of a group including Hesionidae, Nereididae and Chrysopetalidae, as evidenced by the presence of a special internal structure in the chaetae (compartmentalized medulla), and—possibly—by having biarticulated palps, although this latter feature may be present as a homoplasy in some other groups as well. Some of the resulting trees in a recent combined molecular (CO1) and morphological study by Dahlgren et al. (2000) indicated the possibility that Pilargidae could be part of that group as well, although without strong support. Glyceriformia includes Glyceridae and Goniadidae, a group well supported by the presence of a unique cone-shaped and ringed prostomium (Fig. 8), of which the major part anterior actually may represent the basal portion of the fused palps (see e.g., Orrhage, 1999). A recent, detailed revision of the former group by Böggemann (2002) supported the traditional view that Glyceridae and Goniadidae are sister taxa. Figure 9. Glycera sp. from Japan. Copyright © 1998 Greg Rouse. The "Minor holopelagic taxa" include Iospilidae, Pontodora, and Typhloscolecidae. They are highly unlikely to constitute a single clade, but their relationships within Phyllodocida are currently unknown, and they are here listed as a single terminal for convenience only. Other holopelagic groups include Tomopteridae and Lopadorhynchidae, the former of unknown position (presumably) within Phyllodocida, and the latter possibly with a sistergroup relationship among benthic Phyllodocidae (e.g., Uschakov, 1972), or even with several different sistergroups within that taxon, such that they are polyphyletic (Pleijel, 2001b). Alciopidae were recently referred to as a subgroup within Phyllodocidae, and renamed as Alciopini (Pleijel, 2001b); however, their more precise relationships among phyllodocids are uncertain, although Pleijel (2001b) suggested that they may be sought among Pirakia, Pterocirrus or Sige. Figure 10. Left Lacydonia, South Australia, dorsal view, copyright © 2004 Greg Rouse, right Phyllodoce citrina, Norway, anterior end, dorsal view, copyright © 2004 Fredrik Pleijel. Böggemann, M. 2002. 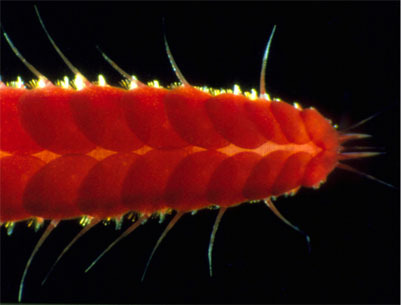 Revision of the Glyceridae Grube, 1850 (Annelida: Polychaeta). Abh. Senckenb. Naturforsch. Ges. 555:1-249. Dales, R.P. 1962. 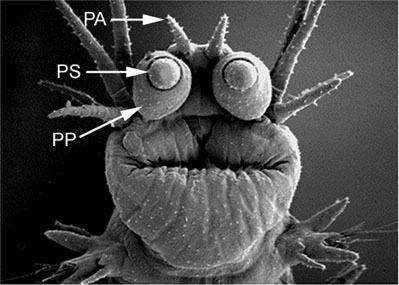 The polychaete stomodeum and the inter-relationships of the families of Polychaeta. Proc. zool. Soc. Lond. 139:389-428. Eeckhaut, I., McHugh, D., Mardulyn, P., Tiedemann, R., Monteyne, D., Jangoux, M., and Milinkovitch, C. 2000. Myzostomids: a link between trochozoans and flatworms? Proc. R. Soc. Lond. Ser. B. 267:1383-1392. Glasby, C.J. 1993. Family revision and cladistic analysis of the Nereidoidea (Polychaeta: Phyllodocida). Invertebr. Taxon. 7:1551-1573. Orrhage, L. 1999. On the morphological value of the glycerid-goniadid prostomium and its appendages (Polychaeta). Acta zool., Stockh. 80:251-264. Pleijel, F. 2001a. 16. Pisionidae Ehlers, 1901. In: G. W. Rouse and F. Pleijel , 16. Pisionidae Ehlers, 1901, Oxford University Press, Oxford, pp. 82-85. Pleijel, F. 2001b. 32. Phyllodocidae Örsted, 1843a. In: G. W. Rouse and F. Pleijel, 32. Phyllodocidae Örsted, 1843a, Oxford University Press, Oxford, pp. 132-135. Rouse, G.W., and Fauchald, K. 1997. Cladistics and polychaetes. Zool. Scr. 26:139-204. Uschakov, P.V. 1972. 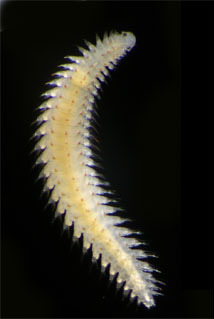 Polychaeta 1. Polychaetes of the sub-order Phyllodociforma of the Polar Basin and the north-western part of the Pacific (translated from Russian by the Israel Program for Scientific Translation, Jerusalem 1974). Fauna SSSR 102:1-271. Wesenberg-Lund, E. 1958. Lesser Antillean polychaetes chiefly from brackish waters, with a survey and a bibliography of fresh and brackish water polychaetes. Stud. Fauna Curaçao 8:1-41. Taxonomic Information Across the Internet. Darwin Initiative Project with information on e.g., Nereididae. Annelid Resources: Another can of Worms. Phylum Annelida, polychaetes, oligochaetes, leeches, vent worms, etc.